They say that hindsight is 20/20, meaning that if you could go back in time and change some of the decisions you’ve made in the past using the information you have today you probably would. But when you’re in the thick of a situation, things can be a bit cloudier. I sure wish someone would have told me a few more things as I was navigating my teens, 20s, and 30s. These are some of the lessons that I’ve learned over the years that I think would be valuable to younger women. Love is a beautiful and powerful thing, but sometimes we use the word “love” way too loosely. When someone truly loves you, they will be there for you through thick and thin, the good times and the bad. When you’re at your lowest and going through some of the hardest times of your life, someone who loves you will still be there. Nothing could keep them away. This includes friends, family members and romantic interests. Learn the difference between love (which is unconditional and reciprocal), acquaintanceship (which is fleeting), infatuation (which is obsessive and toxic), and desperation (which is sad and pitiful). We sometimes think that having a pity party (poor me) and not treating ourselves well will somehow cause others to come to our rescue or sympathize with us. But when you stop caring about and for yourself, you are teaching others how to treat you. When you present yourself as a pitiful person, other people (except those who want to take advantage of you) don’t want that energy around them. It’s naïve to expect MORE love and care from others if you couldn’t care less about yourself. Value yourself (YOUR TIME AND ENERGY MATTERS), invest in yourself (GET THE THINGS YOU NEED TO BE OKAY AND FEEL GOOD ABOUT YOURSELF), and care for yourself (SELF-CARE). It can be difficult to accept when an opportunity or relationship doesn’t turn out the way you wanted it to, and it’s so easy to just give up. But if you can find it within yourself to rebound from the experience and open yourself to looking at another potential opportunity or partnership, you may find that first door closed for a reason. Learn from unfortunate past experiences, but don’t close yourself off to new possibilities. I have said this on so many occasions in the past to women, and I will keep saying it. Dating a man who despises, insults, or constantly complains about his mother can be very damaging to you and your self-esteem in the long-run. When a man has a serious personal issue with his mother, it will likely translate to all of his relationships with women. You could be the sweetest, most understanding, and loving woman ever to walk the earth, but he will still abuse and mistreat you based on his dysfunctional relationship with the woman who brought him into this world. We live in a culture now that says you should be able to do whatever you want, whenever you want, no matter what, without being responsible to anyone else. But that type of thinking is why there is so much rabid dysfunction in modern society—people begin to lose a grasp of their moral codes. People need other people in order to remain sane, be grounded, stay motivated, and help them make the right decisions. It’s okay to be accountable to at least one person in your life, whether it is a mentor, a sibling, a friend, or a respected elder. 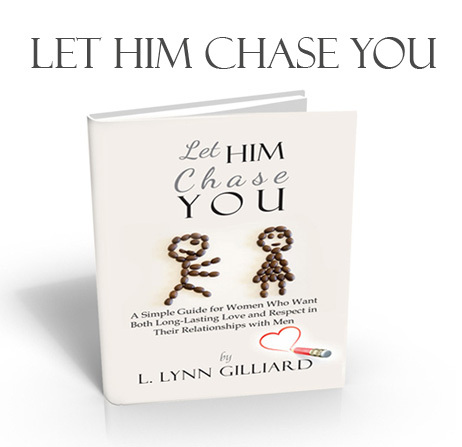 I wrote my book Let Him Chase You after a particularly distressing series of events with a guy that I was in a relationship with for close to a year. I also remembered advice that I was given by a very dear male friend about what is attractive and unattractive to most men (at least the ones you would want to spend time with). Chasing after a guy for love and affection is like chasing a chicken around in a coop. You might catch him eventually, but he will be making every effort to get away from you throughout the “relationship.” This also applies to a lot of other things in life. If something (or someone) is meant for you, it will come to you naturally. We currently live in a sociopolitical climate where the idea of integrity has mostly flown out of the window. Many of our leaders, celebrity figure, and influencers no longer feel that it’s necessary to be upstanding individuals in order to be successful. It’s all about making money and getting as much fame and attention as possible. But having integrity being trustworthy will always be the best way to go about things—even when it doesn’t seem like it in the short run. Think of it this way: if you know someone who has lied and cheated to get the success and money that they have right now in life, would you ever trust or regard that person again in the future if they came to you for help? The way people that perceive you is a form of currency, and it will always be valuable. You wake up, trip over a toy on the way to the bathroom, yell at your kids or the cat, and there you have it. That’s the beginning of your day and how things will most likely go for the next 24 hours. At a certain moment in the day, you have to pause, take a deep breath and shift your energy in a different direction. Say it out loud no matter how crappy you may feel: this is a GOOD day and it will continue to be a good day. Speak positive affirmations into the air, like “I am worthy of love, attention, and good things happening for me.” You can’t control everything in life, but you can control some things. Take the reins of your day and watch as things start to get a little better. If you have ever had to speak or perform in front of a group of people, you know how scary an experience it can be—especially the minute before you go on stage or stand in front of that podium. But once you get up there and you begin to talk, act, or dance, that fear begins to fall away and you do what you have to do. This is true for most everything in life that you’re afraid of. As the book says, feel the fear and do it anyway. If you listen to the fitness fanatics, chefs, gurus, and fashionistas on Instagram and Pinterest, you’ll think that you have to be some kind of superhuman in order to lose weight, eat right, be stylish, and feel good about yourself. But when you try to overdo things from the very start, you are less likely to continue making positive changes. Take it easy at first and build up from there. For instance, instead of doing an hour of strenuous yoga exercises, start with a 5 minute routine on YouTube. Instead of going 100% vegan on your first week, mix vegan foods into your diet slowly but surely until you’re up to about 60 or 70% and start to like it. Taking measured and purposeful actions day by day will increase the chance that you’ll adopt positive new habits as far as your diet, exercise, and other initiatives. Take some time and read through these 11 things that someone should have told you (or that someone should be telling you now) as a woman and see how you might be able to apply it to your life today. If you’re not happy with how things are going, you can always make the decision to change your course and start on a new path.